Contact lens fittings are a service we offer in addition to our comprehensive eye exams and contact lens exams. The optometrists here at First Eye Care have experience in fitting all types of contact lenses, from soft lenses to rigid gas permeable lenses. We also offer specialty lens fittings for astigmatism, presbyopia, and keratoconus. 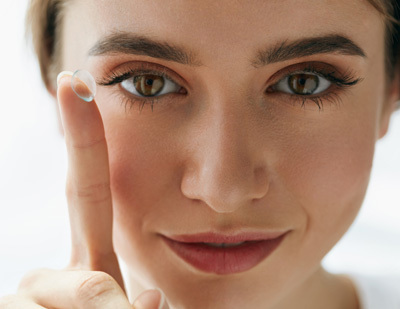 We see many people in our clinics that have had bad experiences with contact lens fittings in the past, which has discouraged them from finding the right lens. At First Eye Care, we will take the time - even if this means several visits - to make sure you walk away with a lens that fits your eye perfectly and is comfortable. When you find the right lens, you shouldn’t even notice that you are wearing contacts. Regular soft lenses - During a pre-fitting exam, we will take a range of measurements of your eye to determine what size you need. This is an important step, as we want to make sure the lens will cover your entire cornea. Toric lenses - People who suffer from any form of astigmatism will likely need toric lenses. These types of lenses are also easy to fit; they will just require a few additional measurements. Monovision lenses - One of the specialty lenses we offer fittings for, monovision contacts are designed for people who need correction from focusing problems that come with the condition presbyopia. Multifocal soft lenses - These lenses are also used to correct presbyopia. If you are being fitted for multifocal lenses, it is very important our team understands your needs, lifestyle, and expectations. Multifocal lenses should fit comfortably right from the start, so if this is not the case, please let us know. First Eye Care has three convenient locations in Hurst, Keller, and Roanoke. Please visit one of these for more information on our contact lens fittings, or to schedule an appointment.